Years ago, most homeowners were satisfied sitting in their plastic furniture on the patio or deck but things have changed considerably. Today, homeowners want more. Modern technology has made it possible for homeowners to combine indoor and outdoor design ideas in a way that makes it look like one flows straight into the other. If you’re like most homeowners, you enjoy getting outside and relaxing during your free time. Cooking out on the grill and socializing with family and friends is a great way to spend your time but you want to be comfortable while you do it. By combining indoor and outdoor design ideas, you can create a comfortable outdoor living space that allows you to enjoy nature firsthand in all the comforts you could ever want. When creating your outdoor design, consider how many people will be using the area regularly, the average number of people you invite when entertaining and how often you entertain. This will help you determine how much space you need and give you some ideas of how to design your outdoor space. Outdoor kitchens are steadily growing in popularity. Homeowners who entertain often love them because you have everything you need to cook and enjoy your meal conveniently located in your outdoor space. Think of the time you’ll save by not having to run back and forth constantly while grilling and preparing the food! Outdoor furniture is more elegant and inviting than ever before, so it’s easy to find items that are durable enough for outdoors but that looks and feels like it belongs indoors. We can help you create the design and choose the best furnishings and accessories for your outdoor space. Just give us a call here at J. 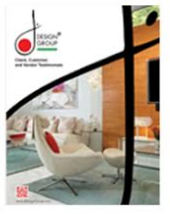 Design Group to learn more about our services. We can help you create the perfect indoor and outdoor design for your home. Lighting has certainly made a big change when it comes to outdoor designs. Choosing the right ambiance is essential when it comes to creating an inviting and fully functional space. This is why you can find a wide selection of lamps and even chandeliers lighting up outdoor living spaces everywhere. Helping you choose the best lighting options for both your indoor and outdoor spaces is part of the services we offer. To keep the design flowing, bring the outdoors inside through your interior decor. One of the best ways to do this is by adding plants to your design. Houseplants will help liven up the room, add oxygen to the air and create that outdoorsy feeling that will be an extension of your outdoor space. Having big open windows or sliding glass doors leading into the outdoor space will give the illusion of the two spaces merging into one. Painting with blues and greens along with other natural colors and using natural textures where you can will also help to enhance the design. Combining indoor and outdoor designs is a trend that’s getting a lot of attention from homeowners and designers everywhere. It’s a great way to create a beautiful living space where you can relax in style.